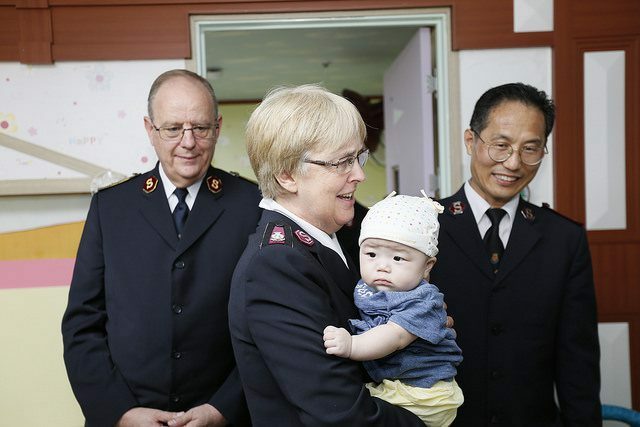 The 110th anniversary of Salvation Army ministry in Korea was celebrated under the leadership of General André Cox and Commissioner Silvia Cox, World President of Women’s Ministries. 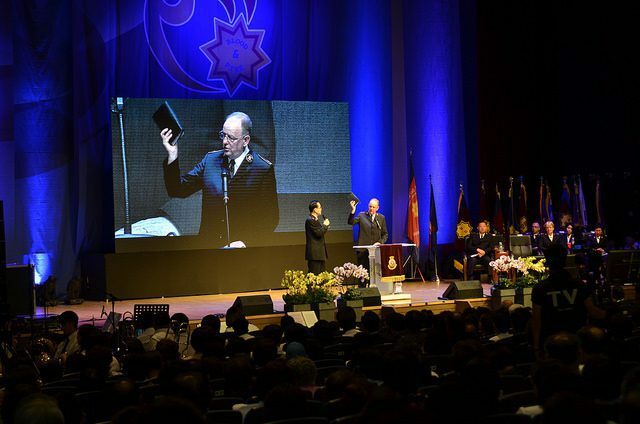 As well as spending time in Korea—leading meetings and visiting Salvation Army programs—the international leaders traveled to the two other countries whose work comes under the Korea Territory: Mongolia and Cambodia. The Coxes visited the training college as well before leading the Sunday holiness meeting at Kwachun Corps. In the afternoon, at a united divisional rally at Yonsei University, Silvia Cox delivered the Bible message. 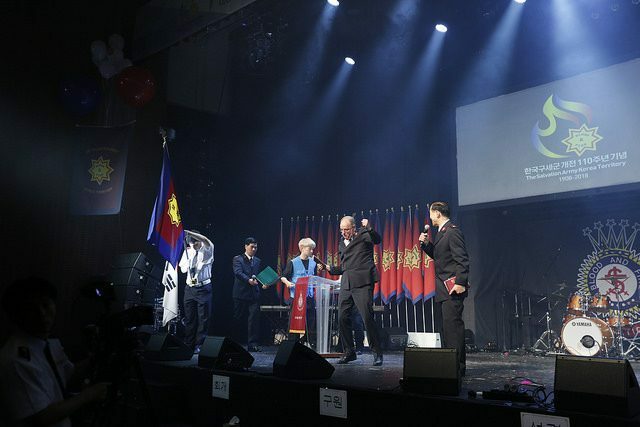 The following day, the General led officers councils for 800 officers at The Salvation Army’s retreat center, which was followed by a march of witness through downtown Youngdong, where many early Salvation Army ministries started. Another united divisional rally then followed at Hannam University, with representatives from seven divisions. 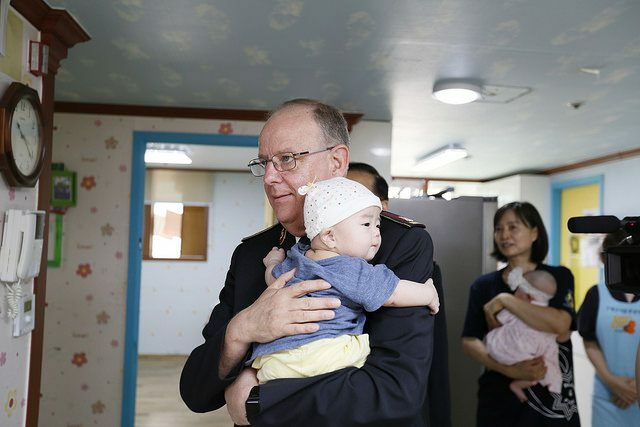 During their time in Korea, the Coxes visited the Army’s Doori Home for Single Mothers and the Seoul Southview Children’s Home, which is known throughout The Salvation Army because residents from the home were taken to the north during the Korean War and never seen again. North Korea was mentioned at a press conference where the General shared his experiences of visiting the country twice through his involvement with a yogurt factory set up by The Salvation Army. At a meal with church leaders, the General introduced and shared international Army ministries and spoke of the importance of ecumenical cooperation. In Mongolia, the international leaders met the Chairman of the National Assembly, Mr Nyamaagiin Enkhbold, who expressed his sincere appreciation for The Salvation Army’s work in Mongolia, particularly with children. An opportunity to share the message even further was realized when the General, Commissioner Cox and Territorial Commander Commissioner Kim, Pil-soo were invited to UBS (Ulaanbaatar Broadcasting System) TV for an interview which was recorded and broadcast on Sunday TV. The international leaders also visited a Salvation Army social welfare center in Tov Aimag before attending a holiness meeting where the General enrolled 14 senior soldiers. Moving on to Cambodia, the General and Commissioner Cox led a united salvation meeting at the Royal University of Phnom Penh, where the General enrolled 65 senior soldiers and the territorial commander presented commissions to eight envoys. The visit ended with a new beginning, as the international leaders opened Kampot Outpost. Following the opening and dedication to God of the outpost, the Coxes visited a pepper farm which is run by The Salvation Army as an income-generating project.